As you see in the pictures we are having some time to create signage and beautify the shed. 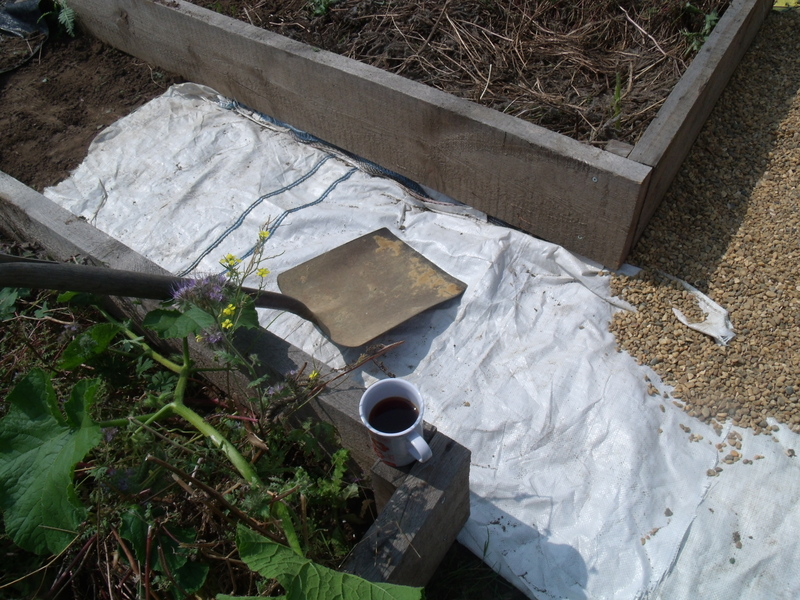 As part of the LAND Learner we will be helping visitors to learn about permaculture – one of our tools will be roof tiles with the principles dotted around the plot. 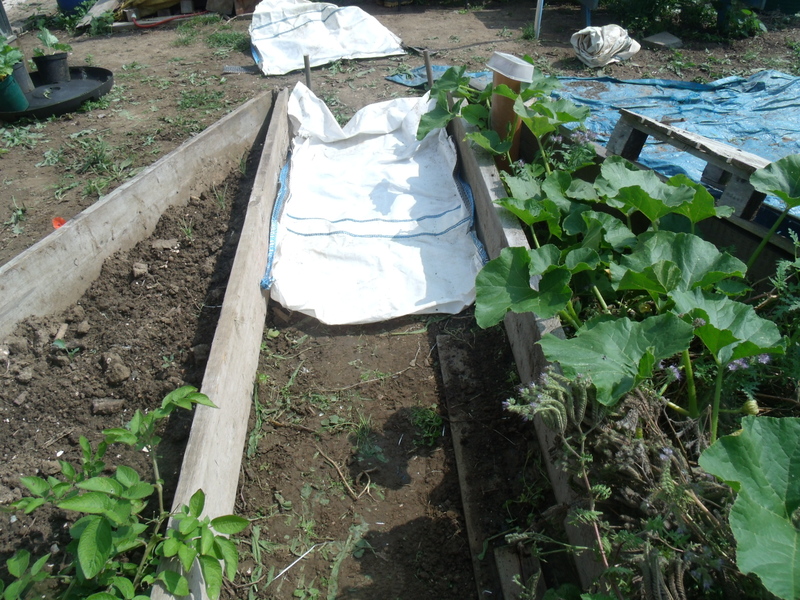 Pumpkins and melons grow fast and are becoming heavier every week so a net was used to support them. Tomatoes although planted late in the greenhouse caught up and some small fruit are visible. M helped us with wedding today as the brambles and nettles liked the hot weather with showers. Thanks the plot looks tidier now. One unexpected find was the puff ball mushroom. It is the third year I am finding it on the paths. Left some to mature and leave spors for next year. Lunch was great with couscous salad, red cabbage salad, noodle salad, home made bread and mozzarella, finished off with homemade cocoa and dried fruit balls. Next weekend some of us are going on an educational trip to Lambourne End. Let us know if you want to come along. Week after we are back on the plot to plant some more and I will bring the Kelly kettle to make us some hot tea and our first stir fry! 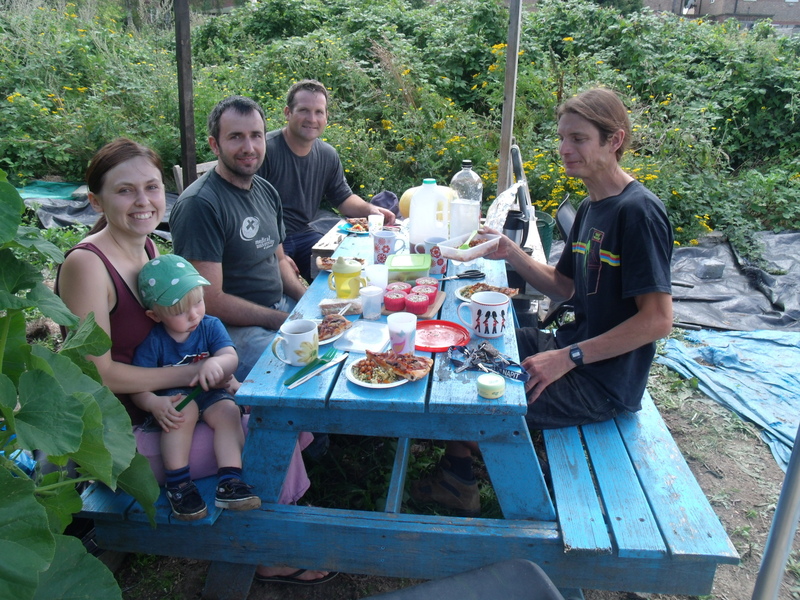 We are holding a Family Barbeque on Bank Holiday Monday the 25th of August 2014. It will start at 2:00pm with children’s entertainment being provided from 2:00pm until 4:00pm. Food will be available at reasonable prices but you should bring your own drinks. Come along and join your fellow allotmenteers and discuss your plans for next year. There will be a sharpening Service on site on Sunday 17th of August. If you bring along your tools then they can be sharpened at a reasonable charge. 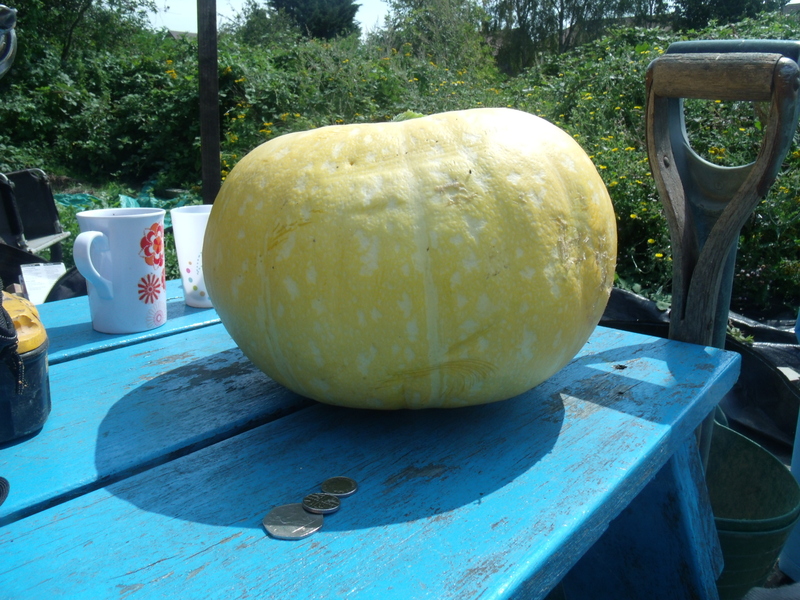 This magnificent pumpkin is the first to be harvested. 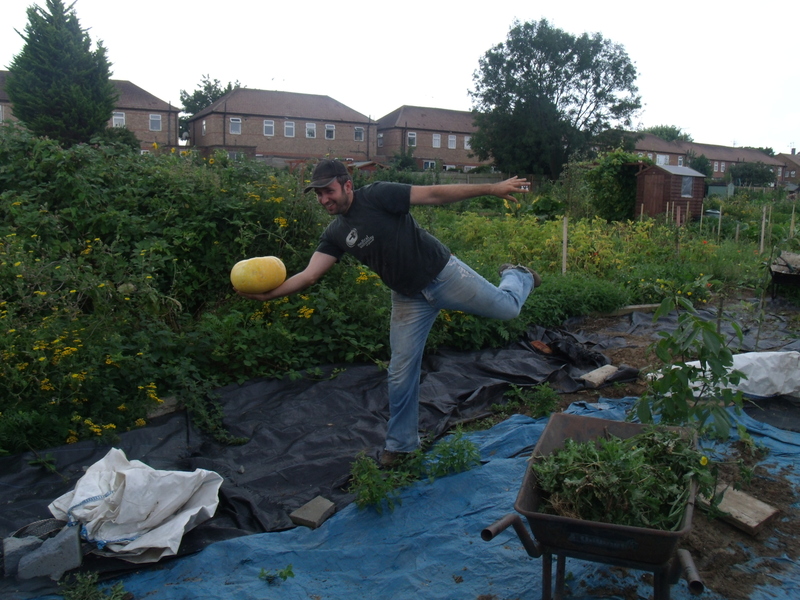 There is a bit of special significance to pumpkins as Kamil used one of his own as a prop at the Southend Soup last October where the allotment was the successful winner of the funds. 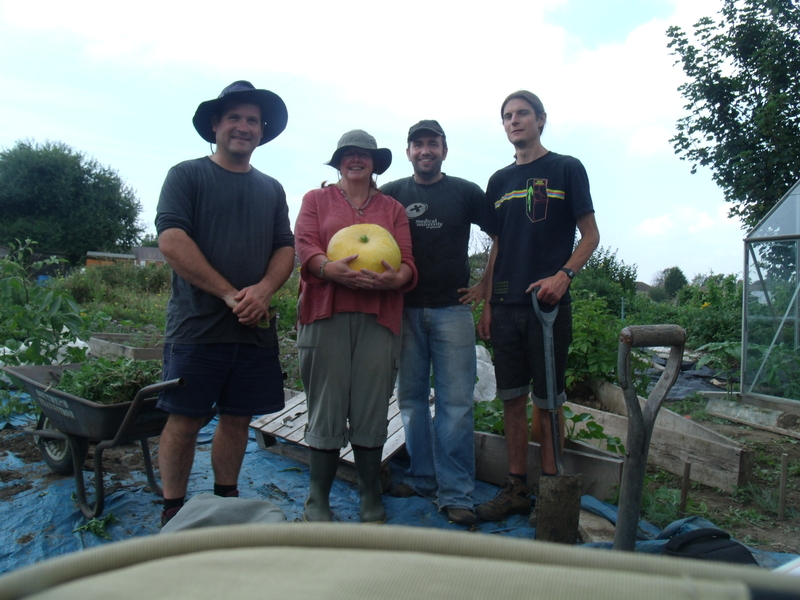 Now we have one grown on the plot and we are in need of funds again. 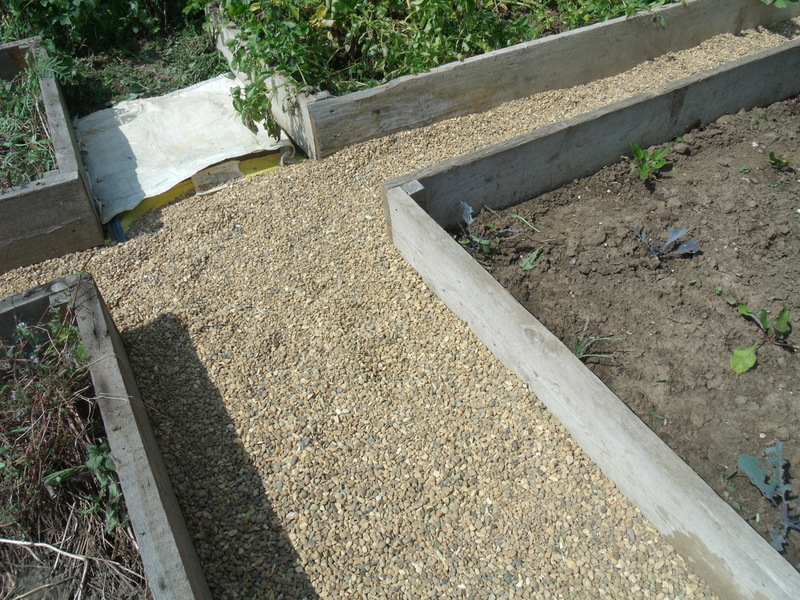 We have started doing the pathways with this lovely donated shingle and it looks fantastic but we need to buy some more to finish it off. This is where you come in Dear Reader…. We are going to auction off this pumpkin to fund more shingle so please dig deep, I know we have lots of supporters and well-wishers and this is your chance to make a contribution. The Auction will run until Friday 08/08/14 12pm so there is plenty of time to get your bids in. It will be run on Facebook as well and I will monitor bids and update on each site. If you are the successful bidder we will be at the site next Saturday if you would like to visit and pick up your pumpkin, other wise we can arrange to deliver it. He worked very hard and gave us lots of useful advice. 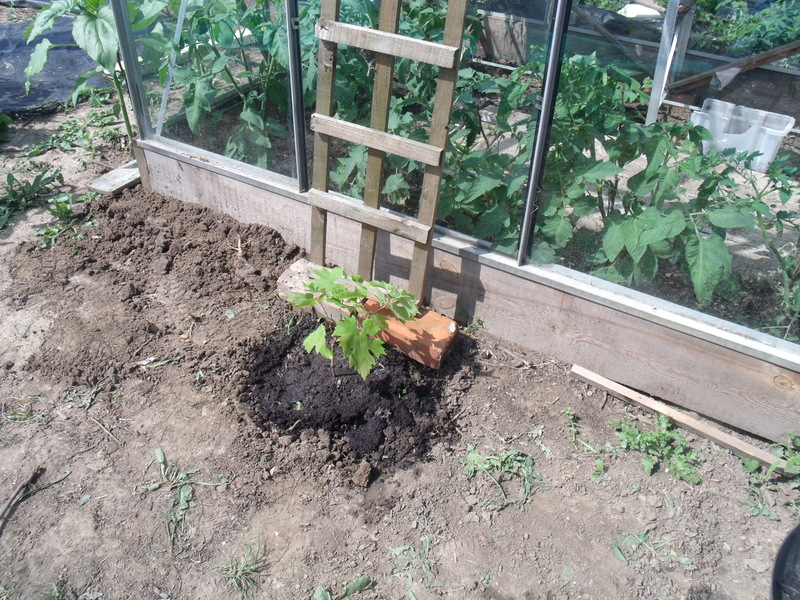 I feel reassured we did the right thing planting the fruit trees. Thank you Jonathan. And then it was time for lunch, Aggie and her son joined us, we are training them up from an early age! PS Dont forget to bid ……..